As you've probably heard, Nismo is the division of Nissan that's responsible for motorsports and hotting up their normal cars with performance goodies. On one end of that spectrum we have the upcoming Nismo GT-R; on the other end, we have this guy. Meet the Nissan Versa Nismo Performance Package Concept, the amped-up version of the Nissan Versa, that car your ex-girlfriend bought when her dad's hand-me-down Mercedes finally bit the dust and she really, really wanted something with a warranty. The car was actually debuted by Nissan of Malaysia, so technically it's called the Nissan Almera Nismo, reflecting its name over there. It's also called the Sunny in other markets. At any rate, this Nismo concept comes with some... um, moderate performance enhancements. Its 1.5-liter engine remains untouched with about 100 horsepower, according to Indian Autos Blog. But it does get fancy new 17 inch wheels, an aero package, side skirts, a Nismo exhaust and a sport suspension. 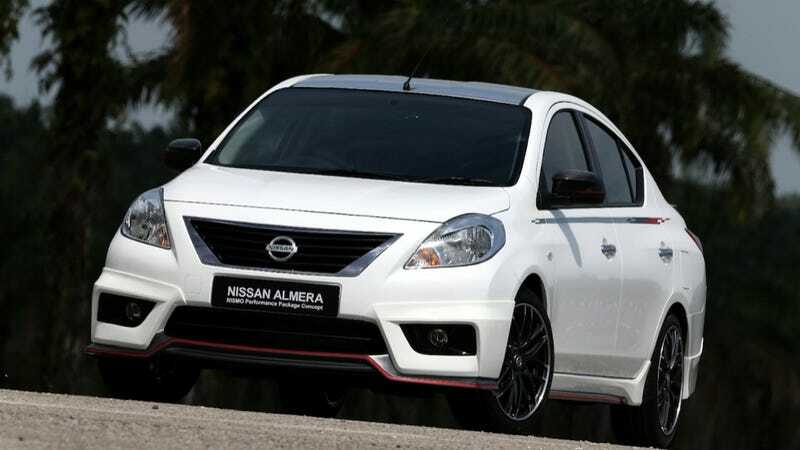 Nissan Malaysia says that the Versa Nismo "is scheduled to be launched in Malaysia in the fourth quarter of this year." No word on whether it will reach our shores or not, so people who want a super-hot Versa may have to just keep waiting.